This will be a two-part post on the comparison of Matthew 24 with I Thessalonians, and then a comparison of Matthew 24 with II Thessalonians. Let's start with a warning from II Thessalonians chapter 2. Paul warns the Thessalonians very strongly that they should not let any man deceive them about “the day of Christ.” The “day of Christ” is the day when Jesus comes for His saints. (I Cor. 1:8, 5:5; 2 Cor. 1:14; Phil. 1:6, 10, 2:16; 2 Thess. 2:2). It is the day of the Rapture. Etc., etc. Just a cursory examination of the "day of the Lord Jesus" shows that it is the day when the saints are finally re-united with their Lord. It is the day of the Rapture. The doctrine of the pre-Tribulation Rapture will admit that the day of Christ is the Rapture in every passage EXCEPT the passage in II Thessalonians chapter 2. This is arbitrarily inconsistent. Why would they do this? 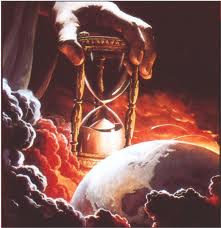 To acknowledge the Rapture in this passage would be to admit that the Rapture occurs AFTER the Antichrist is revealed. Before the Rapture can occur, the man of sin must be revealed. According to Matt. 24 and Mark 13, sometime after the Antichrist is revealed, the angels will gather together God’s elect with a great “sound of a trumpet” (i.e. a trump) from the earth and from heaven. How can the pre-Tribulationist’s last trump come before this trump? If this is not the Rapture, what is it? The Olivet Discourse, given just days before the Crucifixion, agrees exactly with the order of events in I and II Thessalonians! When Paul uses the phrase “as a thief” (I Thess. 5:2, 4), he is borrowing from the Lord’s Olivet Discourse (Matt. 24:36)! He is NOT referring to an at-any-moment imminent Rapture, but to the same event the Lord was referring to — His own post-Tribulation return! Tribulation Saints are "in the Lord"
My name is Christopher. I grew up in Akron, Ohio and recently moved to Columbus (Aug '09) when the Lord spoke to me about taking a new job down here. I am happily married to my beautiful bride, Rebecca. We have 2 ornery little boys (7 & 5 years), and a baby girl who likes to laugh a lot.